Shrub 1 - 5 m tall Leaves: opposite, stalked, shiny green above, dull green beneath, 4 - 10 cm long, rounded to lance- egg-shaped with a heart-shaped base (sometimes) and pointed to rounded tip, sharp-toothed, sometimes with star-shaped hairs on the lower surface (at least on the veins or in vein axils). Leaf stalks 8 mm - 2.5 cm long, sometimes with star-shaped hairs. Flowers: in branched, compound clusters (cymes), which are borne terminally on the stems. Cymes mostly five- to seven-rayed, flat-topped, to about 13 cm wide. The leaves subtending the cymes have leaf stalks over 7 mm long. Corolla five-lobed, white, 4 - 5 mm wide, bell-shaped, sometimes sparsely hairy internally. Corolla tube to 1.2 mm long, 2 - 3 mm wide. Stamens five, exserted from the corolla. Anthers yellow. Stigma three-lobed. Fruit: berry-like (drupe), in red-stemmed clusters, bluish black, 5 - 10 mm wide, spherical, single-seeded. Twigs: slender, angled, downy when young, becoming hairless with age. Form: rounded with arching branches. 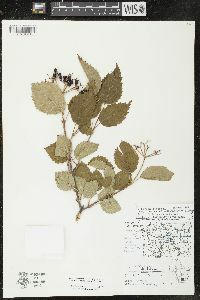 Similar species: Viburnum rafinesquianum is similar but has stipules on the leaf stalks. Also, the leaves subtending its inflorescence have leaf stalks no longer than 7 mm. Three varieties of V. dentatum occur in the Chicago Region: dentatum, lucidum, and scabrellum. See their links below.